Summary: This article explains how to fix an SSD not showing up on Windows 7, 8, 10. It is a glorious moment when you have installed an SSD drive into your computer, but not very glorious when you find that your SSD is not showing up in device manager, or disk management, or anywhere. But not to worry. There are a few reasons why this happens, and the solutions for these problems are simple. First, you need to open Computer Management. There are two ways to do this. The quickest one is pressing Win+R and typing “compmgmt.msc” on the window that opens. Alternatively, you can open File Explorer, right-click This PC, and click Manage. Click “Disk Management” on the panel to the left of the window and you can see a popup window. To initialize your disk, tick the box next to your SSD and select a partition style. We recommend that you choose GPT (GUID Partition Table) since this is the more updated partition style, and it is recognized by all versions of Windows. Click OK to start the initialization. When finishing the initialization, you can now to proceed to create a new volume using Disk Management. This will finally make your SSD show up in File Explorer. If your disk is showing up in Device Manager, but not in the This PC folder in File Explorer, the problem could be that your SSD doesn’t have a drive letter yet. There are two ways you can assign a drive letter. The first thing you can do is to go to File Explorer and click This PC. On the top part of the window, you will see Map network drive option with a hard drive icon. Click that, select a drive letter that is not being used at the moment, then find your SSD through the Browse option. Then click Finish and restart your computer. Your SSD should appear in Windows Explorer after that. Another way to do this is to go back to Computer Management (Right click on This PC, then click Manage). If you click “Disk Management”, you will see to the right a list of all the hard drives present in your computer. Select your SSD (it will be the one that doesn’t have a letter” and right click. Click “Change Drive Letter and Paths” among the options. Next, click “Add” on the window that shows up and chooses a drive letter on the list. When everything is done, click “OK”. Your SSD should be up and running. If the previous solutions do not work, the problem might be a compatibility issue between your SSD and computer. There are different formats that a storage drive can have. And there are only a number of specific formats that can be read by certain operating systems. What you need to know and always remember when about formatting storage drives is that it deletes all of the files in the drive. If your SSD is newly purchased, then formatting it won’t affect anything. But if you have files in it, you might need to backup or restore any files that are in the drive. Now, backing up the files from a drive that is not showing up in File Explorer is tricky. It’s not showing up in the first place! Fortunately, you can use data recovery software to retrieve your files. One of the best programs that you can use to do this is Bitwar Data Recovery. You can use it for free, and the data recovery process only takes 3 simple steps. Here’s how you can recover your files before formatting. Step 1. You will need to download and install Bitwar Data Recovery for Windows 7, 8, 10 or Mac. Once you have created a free account, you can get started on the three-step process to recover the data in your disk. Step 2. Select the partition or device. You are able to see the list of drives present in your computer after launching the software. Select the one with your SSD in it, and then click “Next”. Step 3. Choose the Scan Mode 1 and go next. Once you have picked which scan mode you are going to use, click “Next” to proceed to the next step. Step 4. The third step is to narrow down your results by selecting the file type. 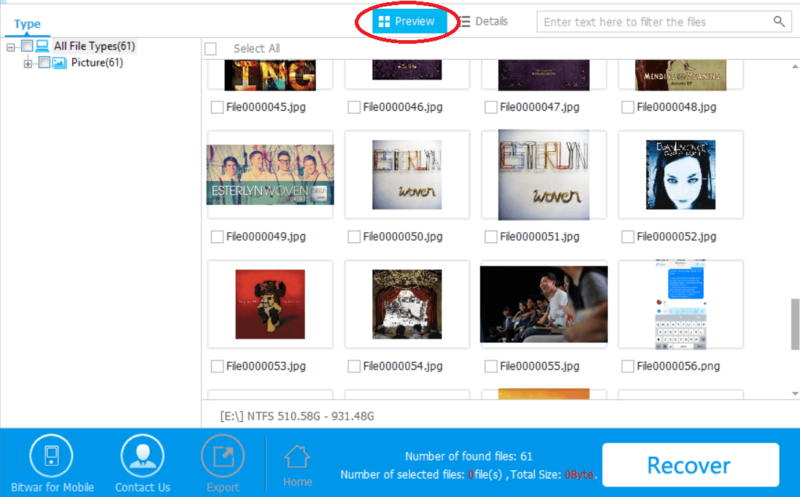 You can select which file types you want to recover. Or you can simply select all file types if you want to cover all. 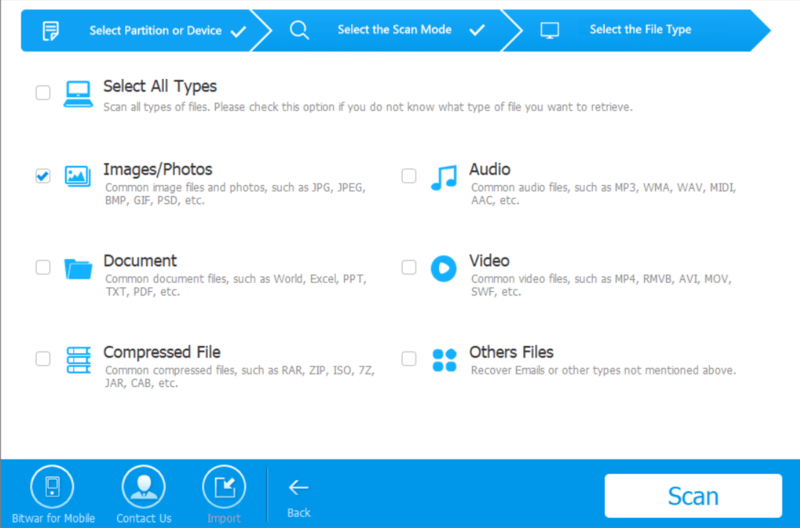 Click “Scan” to recover your files. Step 5. Preview the lost data as you want. This is a good way for you to check if your file is still in good condition or not. If it is, you can simply click recover and set the save destination folder for your file. After you have recovered your files, you can go back to the Map network drive option, reassign a drive letter to your SSD, and you and find the option to format your drive. Take this option and set your disk to a format compatible with Windows. You can choose FAT32 and NTFS Format for this. At times, when you find that SSD not showing up no matter on Windows 7, 8, 10 or Mac, don’t panic, there are still have the solutions for you to fix the error. And what if there are having vital data on it, just try to use the third-party data recovery software to retrieve the data first and then figure out that formatting or assign the new drive letter on your SSD whether can fix the error. What you would need to first go for is the Quick Scan. This is the fastest way you can retrieve files from an SSD not showing up on File Explorer. This will also recover your files in their current state–with their respective filenames, latest versions, etc. If Quick Scan does not retrieve all the files that you want, though, you can opt for the Deep Scan. This will browse the deep sectors of your drive that the Quick Scan can’t reach. This scan provides more results and really takes its time scanning your drive for files. Although the downside for this scan mode is that the files recovered will be in generic filenames. The other scan mode available for Bitwar Data Recovery would be Formatted Recovery. This the scan mode designed for recovering files after formatting your drive. If you need to recover files even after you have formatted your drive, this is the scan mode that you need. Quick Scan worked great and easy, in a few minutes all the files were available to recover. They payment process was fast and secure, had a great experiencie with the software, very happy with my purchase. Thanks for using our data recovery software and we are always here if you need our help. Thanks and have a nice day! Solution 2 worked perfectly! No important data there so no bigge. Will have it in mind for the next situation (more like crisis) SSD working great again, thanks! OK, Damien, that’s good to hear, wish you a nice day and if you need further support, please don’t hesitate to let us know. Have a nice day! Thank you, the software worked perfectly, also glad that the guide included the differences between the scan modes. I think that it is a very easy to use software, but still necessary to know that type of things ahead. Good product, pleased with my purchase. Thank you for your purchasing, Frank, we are here to support you whenever you need us. Have a nice day. Stop by just to thank you for taking away this huge headache made by my SSD . Simple and efficient step by step, worked great, very recommendable to follow the guide, cheers! Thanks for your comment, Matthew, we would like to say thank you too that you can give the feedback on how our article can do to help resolve your issue. Anything you need further support of using the data recovery software, please don’t hesitate to let us know. Have a nice day. My personal experience with SSD has been great, they improve a lot the computer’s performance, and is not that common to get an issue with it, and when it does, very simple to fix. First time using the bitwar, since I heard was the best among similar software, in my opinion it is a really good software, worth it. Hi, William, thanks for your kindly review and we are always here to help if you need. Thanks and have a nice day. Awesome! Got my ssd few months ago, incredible update for my computer, way more faster, was scared that it was broken or damaged but the first solution already worked perfectly haha! Thank you very much :)! You are welcome, Sophie, send us other questions via email if you need support from us. Have a nice day. Hello, I’m the person who was in the support chat a couple of minutes ago, just wanted to say thank you again, it’s really nice when someone helps you with this level of kindness, really pleased with your support, glad I got the software and I had the support to solve my issue, good job! Hi, Helga, that’s nice you have solved your issues, and anything you need from us, don’t hesitate to chat with us again or send us an email. Have a nice day. Great job! thank you for giving updated information! So far I’ve only tested the solution 4 with the Bitwar Data Recovery, since I already have it (used it for a couple of flash drives, laptops, and phones) worked great as always! Hi, Jude, thanks for your review and that’s nice you always keep Bitwar running in your computer, anything you want to ask, send us an email or click on the live chat icon to start the conversation with us. Have a nice day! Hello again! THANK YOU! followed your steps to make my SSD show up, then used the software (bitwar) to restore everything, really really glad, thank you for such a fast reply! Will definitely use this software for so many things haha! Hi, Kate, that’s nice you finally got back your SSD, have a nice day! Hello, should I try this solutions in order? or are they specific for different causes? I’m afraid that just trying randomly I could make it worst or create irreparable damage. Does the Bitwar data recovery fix all the problems no matter the causes? Thank you for paying attention to my doubts before I take any decision, don’t much about computers, so I rather take it slow!, byebye! Hi, Kate, if you are facing the problems that SSD not showing up on your Windows PC, you can follow the solutions mentioned above to get your SSD worked again. There are 4 solutions for you to overcome the issue. And if you did lose the data from your hard disk, our data recovery software is exactly what you need. Moreover, the software can help recover lost data from accidental deletion, formatting, virus attack, inaccessible hard disk with RAW issue, Data lost after emptying the Recycle Bin and many other common data loss scenarios. If you are still feeling puzzled while using the software, send us the email or go to the live chat to talk with us. Have a nice day! Useful as always guys! Hope many people are grateful as me, very good job! does it works the same when the SSD is the one holding the system, like windows? I’m planning on having that config, just having the SSD for system and main games.